A few more parasitic replica companies have surfaced in the Z community over the last couple years and they have become fairly popular. We referenced one in a post back in December. Because there are LIKE-seeking "enthusiasts" and e-fame cravers everywhere, these companies are successful. It is believed that there is a correlation between the "I want it now and I do not want to work or wait for it" mentality and the price of the vehicle. Unfortunately, the Z is not as expensive as it once was, and, thus, corner-cutting is rampant. Sadly, replica parts are selling. Some of these replica companies pay to advertise on social media. Occasionally I come across some of these ads. Of course, the dogma/essence/premise behind JDMphasis is to encourage support of authenticity, originality, and innovation. One of our tag lines, so to speak, is "Be Real. Buy Real," so I found it somewhat ironic and humorous when I see one of the advertisements of one of these replica companies pop up and note the tag line they are using. "Be American. Buy American." As I understand it, to "be American" means to exercise freedom in the marketplace. If I choose to buy a Nissan or a Toyota pick-up truck, am I not "being American" because I did not buy a Ford F-150 or a Dodge Ram? No. Not at all. In fact, I would argue that the competition in the marketplace not only benefits the consumer, but also the businesses themselves. Economics aside, this replica company is full of hypocrisy from the implication that you, as a consumer, would not be American if you chose to buy from a company that made parts elsewhere in the world, such as Japan, but also in the laughable "Built by us, inspired by you" slogan. (No, inspired by the Japanese companies whose designs you ripped off.) 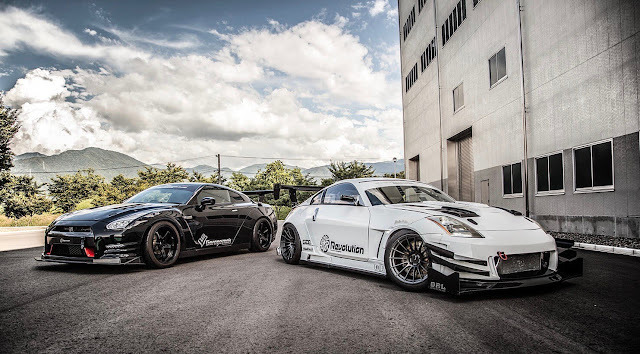 A quick search of their website shows us that they have stolen designs from companies such as Nismo, INGS+1, Chargespeed, Rocket Bunny, among many others… Notice anything about these companies? Yes, all Japanese. Anything else? Yes, they are all parts for, you guessed it, Japanese cars. So, does this patriotic company REALLY want you to be American and buy American? Nahhh… If you did, what would happen to them? Just another fly-by-night replica company looking to make a dollar by ripping off the real talent of the Japanese tuning industry. Support originality and innovation. Save your money for a bit longer and buy from the companies who researched, designed, and risked to bring these parts to reality. Plus, if you choose not to buy from these parasites, you will not have to receive a bumper that looks like a Frito.